Any title of any clothing store that includes Farm Life has to be checked out. I am so happy that the owner, Michelle, reached out to me to do a review and a give away on my blog. This post was a long time coming, but with three little ones of her own she was very understanding that sometimes life just zooms right by. The first thing I did was check out Michelle’s blog, Simplicity Speaking. Michelle and her family have such a sweet and genuine story I knew that I would love to partner up with her! Still cute though! And I really need more t-shirts in my closet. I am a slouchy tee type of person or a tank top paired with a sweater would be an even better description of my wardrobe. 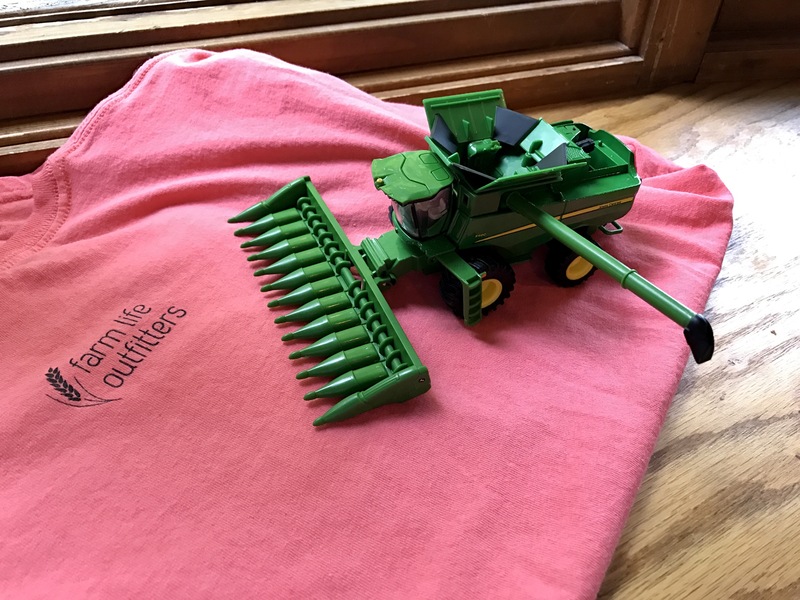 But, I have really been looking for a t-shirt that felt feminine and comfortable; one I could grab for working on the farm or running into town for parts. This is perfect for that. I loved the pink color, but really love the other color options on the site. I love options, especially when they aren’t your basic- black, blue, red, etc. I really loved the chicken shirts too! Maybe it’s because we have recently become chicken owners. And I use the term ‘we’ loosely. Really, just me, became a chicken owner. Another thing I really like, as silly as it seems, is the logo on the back of the shirt near the neckline. I have worn tons of shirts for different groups and I love it when the logo is in this place. Super silly I know- but I do, I love it! I’m hoping that all of my readers will head to the website to check out what she has available. Maybe even make a purchase…or two! And if you think you might… use the code ‘FARM15’ when checking out. That will give you 15% off your order! And I am really excited to offer a give away for one of my readers. Just comment below to be put into the giveaway and my randomiser will select a winner on Saturday at 12N. 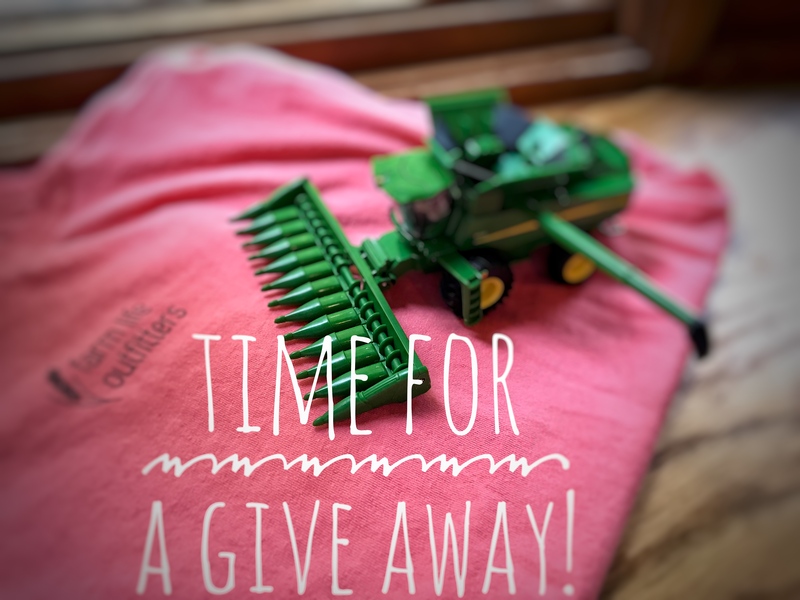 The winner chosen will receive their choice of a t-shirt from Farm Life Outfitters. So excited for you to pick out your new Farm Life Outfitters t-shirt. Please share with us the one you choose! I wish I had a brood of chicks on our farm. Or even just a couple! Need to get Mr. Farmer on building a coop. Cute shirts and messages! 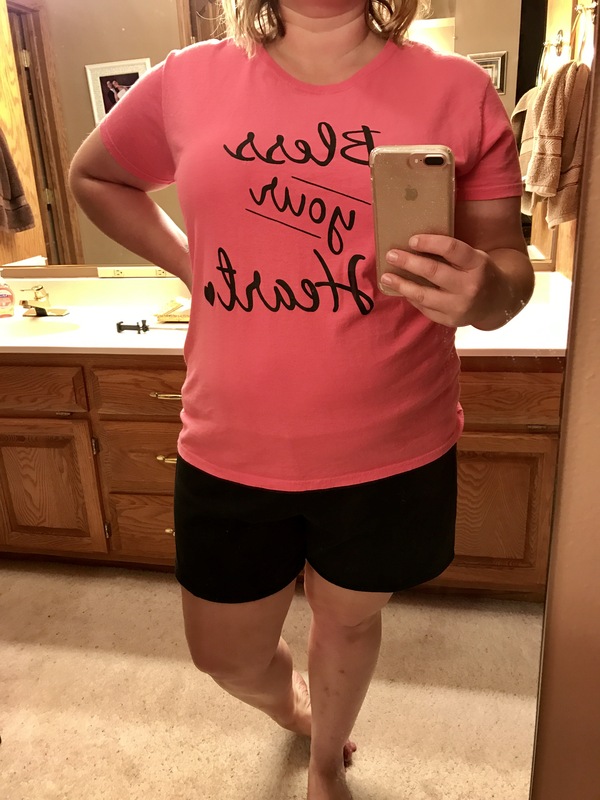 I love the bright pink Bless Your Heart shirt!! Super cute! Such cute shirts. I understand about your mosquito problem. I scratched so much I drew blood a couple places on my legs. What a cool company! I’ve missed your blog! Thanks! Life, as you know, with little ones is so busy! I love the logo too!!!! Cute shirts! They are all cute !! 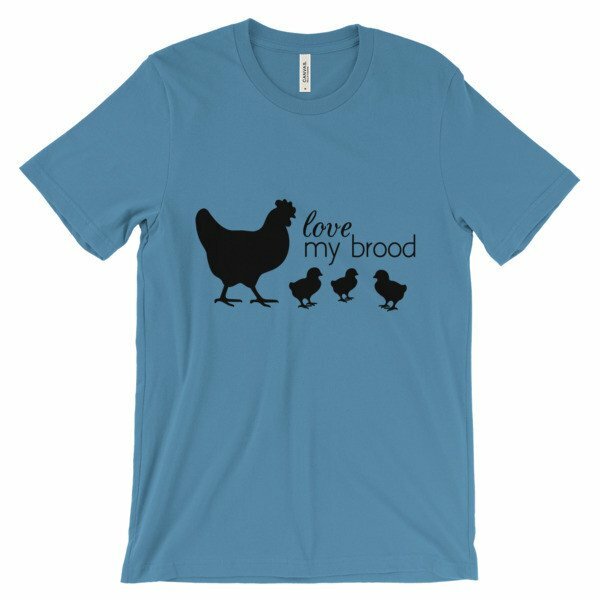 I need the “Love Your Brood” red t-shirt! There is nothing more simply southern than a well-placed “bless your heart!” Thanks, ladies, for the chance to win! Those are super cute! I like the chicken ones. This is an awesome idea for a giveaway! Cute shirts! I would pick the yellow Simple Life tee! Very cute. Love the “Bless Your Heart” shirt – and so great that it comes in a long sleeved option! Fun! I just became a farmers wife! Welcome to the group of farmer’s wives Amanda! I need that ‘love my brood’ shirt! Love it! It is seriously the cutest Tiffany! Cool shirts! Going to look at the website now! Bless your heart …gotta love it! Since we’re having our first in roughly a month so I’m definitely diggin’ the “Love my Brood” shirt! Praying for good weather so we can get the crop out before our little one joins us! Thank you for sharing! Thank you for sharing. They are really cute! Love these shirts! So unique!! Love the farm wife outfitters with the wheat!! 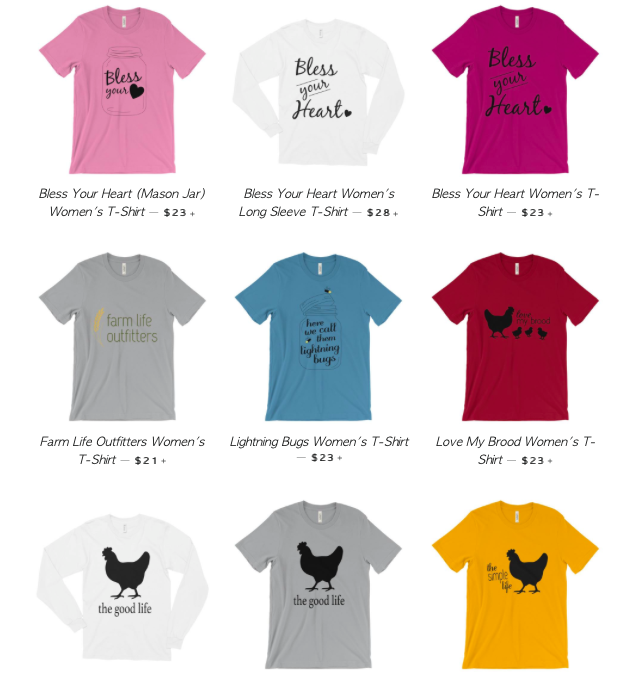 Love the shirts – since I have that Urban Farmer Son; Bacon Swamp Farms…those lil Chicken shirts are gonna be a must … and Lord knows we can never express the Bless Your Heart statement enough. I certainly enjoy reading your blog and those that you partner with/review Nicely done. Keep it up and we will continue to follow, read, and be educated in many ways. Love, Love, LOVE the Bless your heart ones!! New to your blog, but can’t wait to check it out and relate!! These T-shirts are the cutest! So fun! Love the idea! Congratulations Tana! You are our winner. I will email you with more information on how to get your free t-shirt! Thanks so much for commenting! Love the shirt! My wardrobe needs 1 or 2 or maybe more! Your shirts are adorable. Hard to choose just one! I love these. I’m constantly saying ” Bless your heart”. Love reading your blog! Hi Morgan, love to read your blog and what interesting story I read about you, found your blog thru Hungry For Truth SD. I totally stalked you on the HFT page too! Welcome to South Dakota. I can completely relate to not being born here! And your story was so, so sweet! I look forward to meeting you at something Ag related soon!